The Romanesque cathedral’s construction began in 1099, but modifications continued until the 14th century. 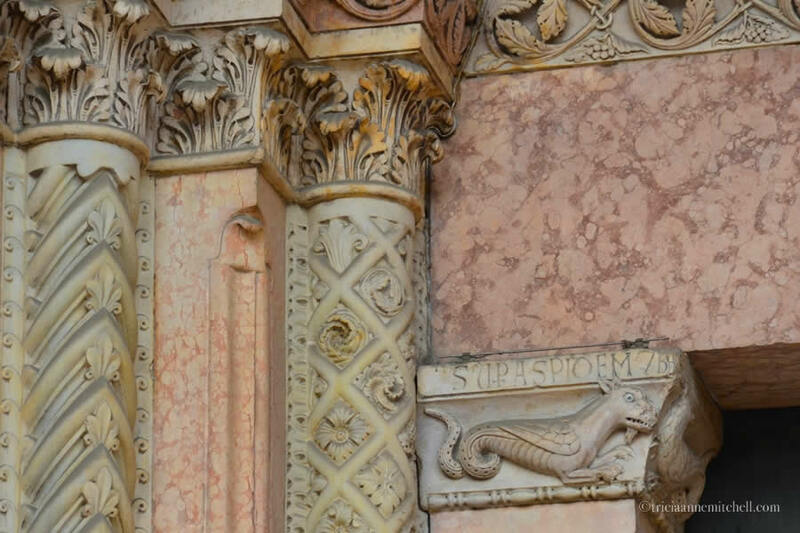 The product of this patient construction are stunning decorations that have stood the test of time. Today, they continue to tell biblical stories through imagery of saints, flora, fauna — even imaginary creatures. 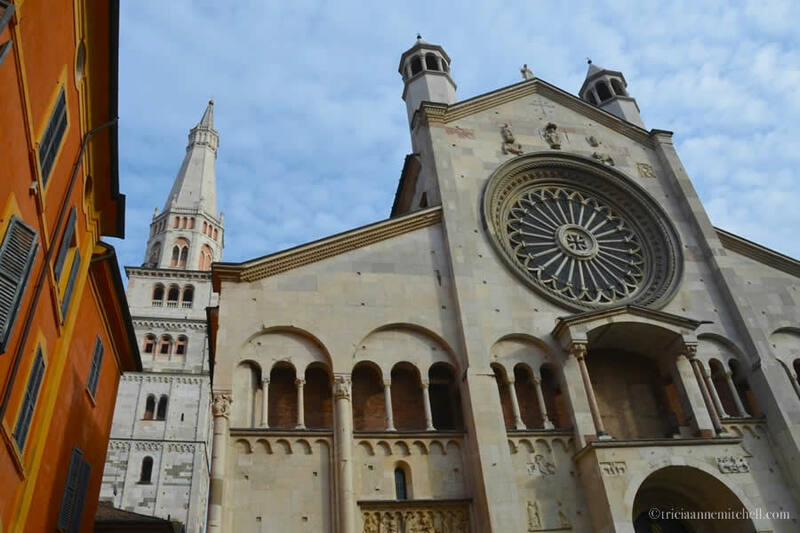 Modena’s cathedral was designed by Lanfranco, and features work done by sculptor Wiligelmo. Since the cathedral took more than 200 years to complete, Lanfranco and Wiligelmo were succeeded by a series of other workmen. The cathedral was added to UNESCO’s World Heritage List in 1997. Inside, its crypt houses the remains of St. Geminianus, Modena’s patron saint. The cathedral’s main entrance. On the left, you can see the The Ghirlandina Tower, which was completed in 1319. In Italian, its nickname means ‘Tower of the Garlands’ because of its elegant decorations. 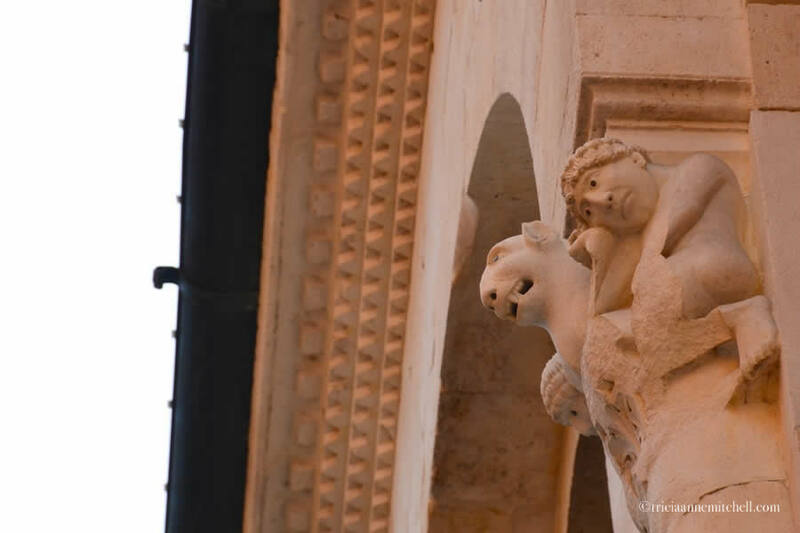 It provided the vantage point for guards to watch over Modena’s town hall as well as its city center. 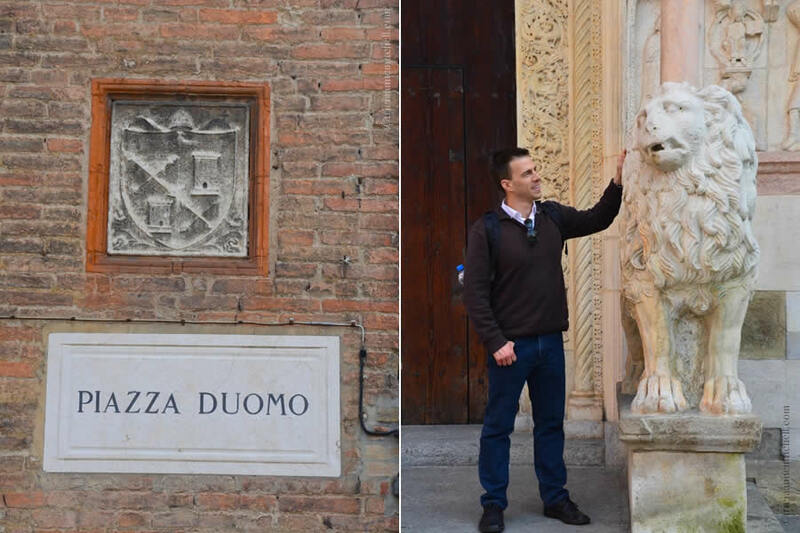 On the right, Shawn mingles with one of two sculpted lions which support columns on the cathedral’s entryway. 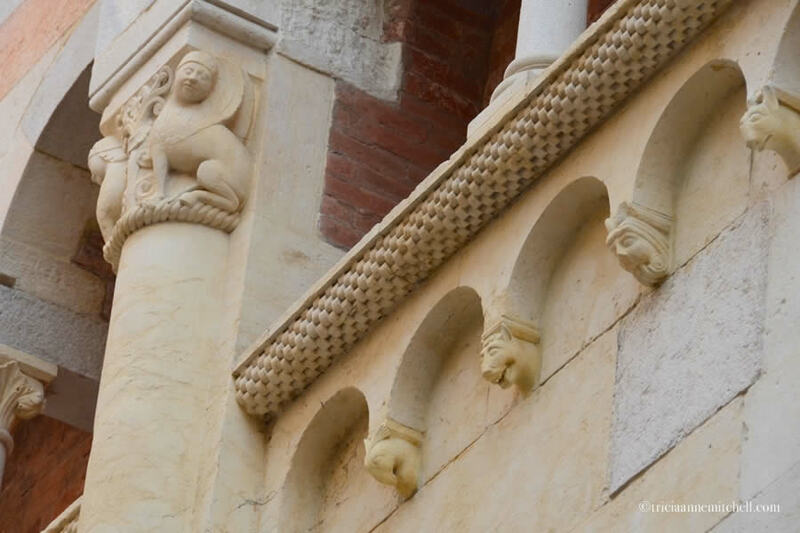 The lion pair dates back to the 2nd Century AD, and it’s believed they were incorporated into the cathedral’s design after being unearthed. Present-day Modena grew out of a former Roman colony named Mutina. 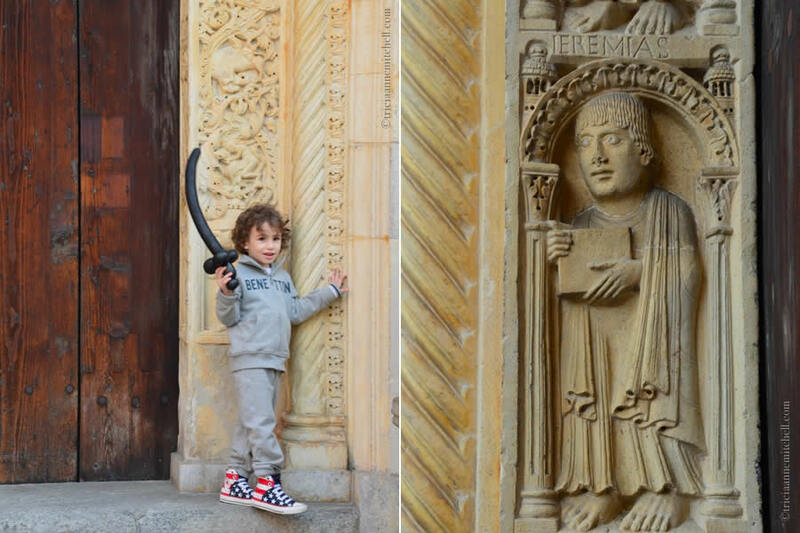 A boy plays hide & seek with a black balloon sword in hand. 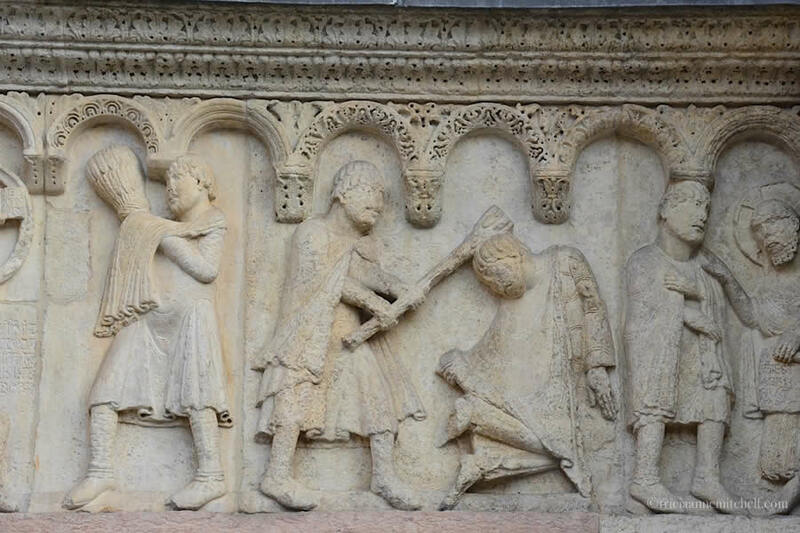 On the right, one of many saints carved into the cathedral’s exterior. 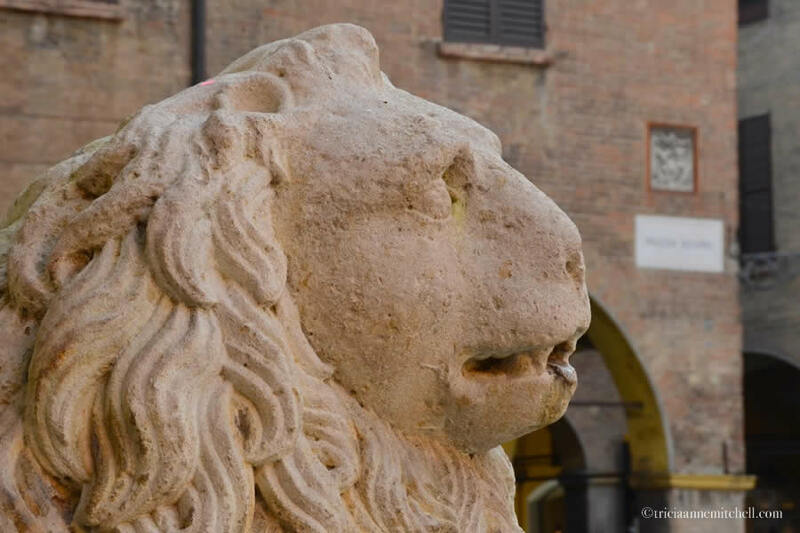 Detail of the 1,900+ year-old lion sculpture. The cathedral’s details, such as these wedding-cake like carvings are incredible. 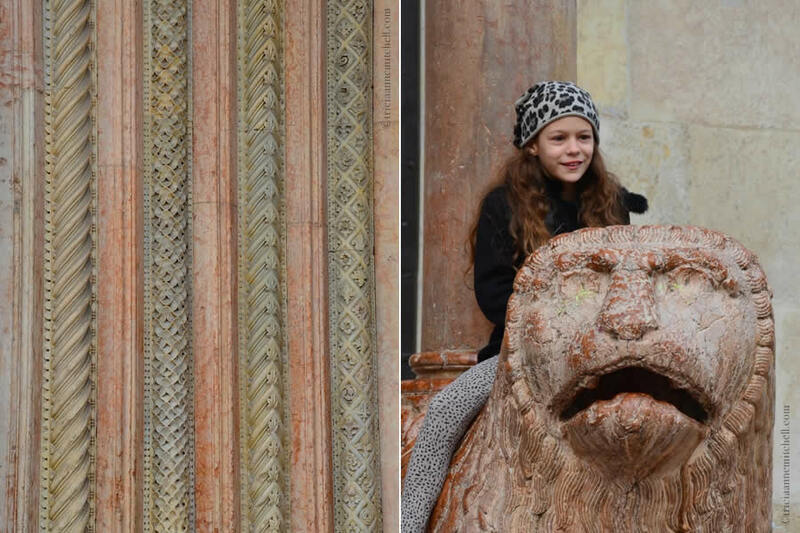 On the right, a girl sits atop a lion on the south-eastern side of the cathedral, known as the Porta Regia. The cathedral’s rose window, which dates back to the 12th Century. 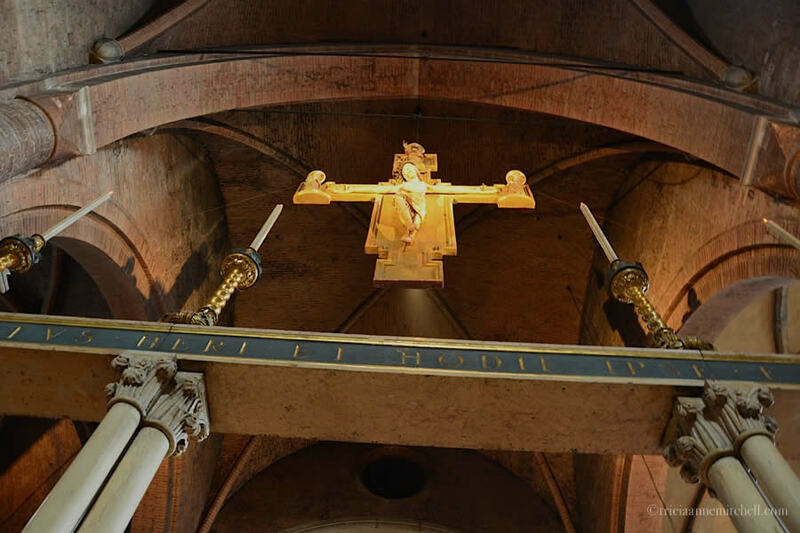 A gold crucifix dating back to the 14th Century. The Duomo’s crypt houses the tomb of Geminianus, Modena’s patron saint. 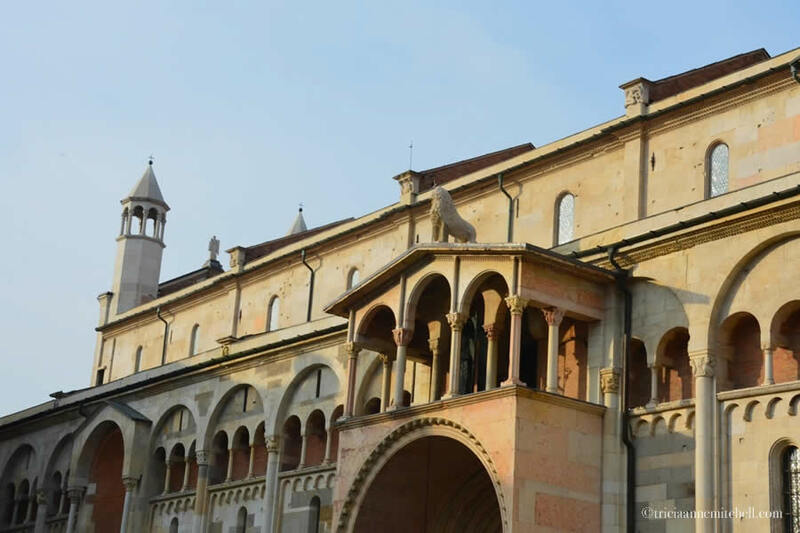 Determine opening hours and other details on the Modena Cathedral website. An extra special thank you to Nick and Francesca for coordinating the details and making us feel so welcome in Emilia-Romagna. Terri, I hadn’t made that connection with the Wizard of Oz lion, but I absolutely agree! If I read the brochure correctly, the lion that Shawn’s petting was actually sculpted by the Romans, later unearthed, and ‘borrowed’ by the designers of this cathedral. Pretty fascinating! As for us, I regret that I haven’t been able to keep up with all your adventures on Gallivance lately, or my site. It’s been a bit of a wild summer, and you know how it is setting up new ‘systems’ in your temporary home away from home. 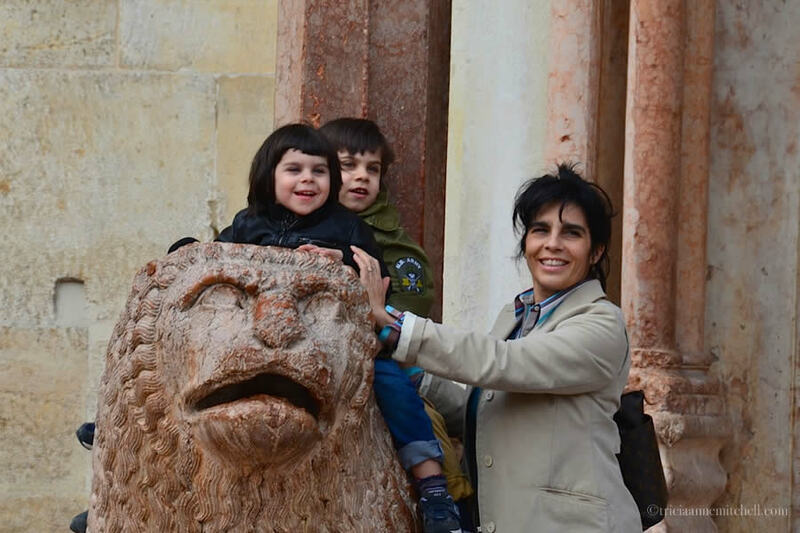 After Italy, we had a brief stop in Germany, then on to Serbia, then to Spain and France to visit Shawn’s parents, then back to Croatia, Bosnia-Herzegovina, Serbia again, and now Bulgaria. Bulgaria is our home for at least the next few weeks and we’re loving living in a tiny village. Hopefully more on that soon. Where does this weekend find you two? Such amazing detail in the marble! I wonder if there was a grand plan of those intricate carvings before they started or if the craftsmen made it up as they went along? Melinda, that’s an intriguing question. Considering that the construction of the cathedral took so long, there must have been some varying interpretations taking place. :) In a region that’s seismically-active, it’s also impressive that these churches have stood the test of time. 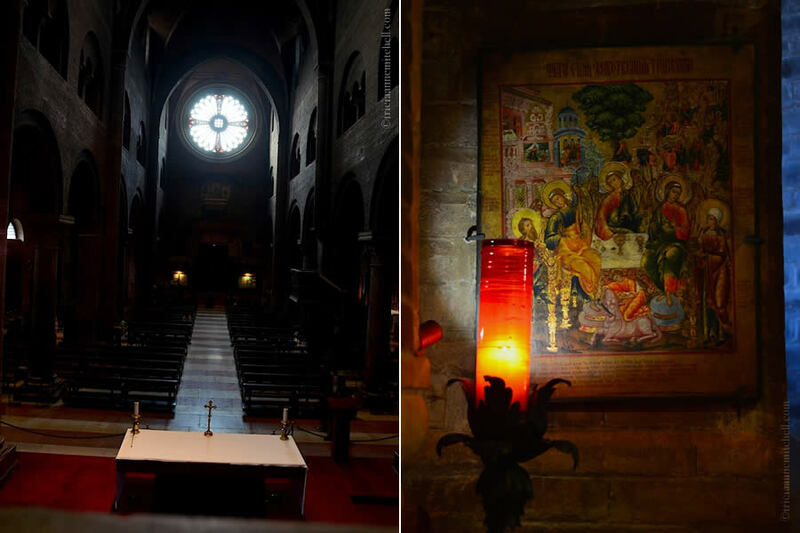 Tricia, thank you for sharing your well taken pictures of that beautiful cathedral.